A church is more than just bricks and mortar, it also is the people who belong to the community. We are the bricks, and our faith is the mortar. This is the background to our community at St. Barnabas. We love our church building, but we also see ourselves as the body of the church in the community. The church building itself includes the worship space, two halls and four small meeting rooms. One of the rooms also houses our library. The worship space and the lower floors is equiped with a handicap access elevator. 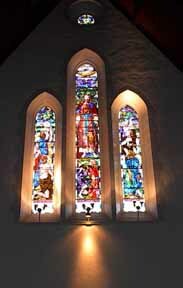 Regarded as a historic Anglican church, since 2010 we have been accepted for grants from the Heritage Foundation. This allowed for the installation of a fire alarm system, and the restoration our beautiful stained glass windows, the repointing of parts of our exterior brick work as well as ﻿﻿many other necessary structural repairs to the building. Restoratation will continued into 2015 with a new roof and 2016-2017 with other structural improvements. We look forward with anticipation to seeing old friends come back to worship with us on Sundays, and hope that we will be meeting many new friends who would like to visit or join our community at our beautiful St. Barnabas. Within the parish we have many active groups that always welcome new members and visitors. To learn more about any group on the list please call the church office at(450) 672-5560 or email us at ﻿﻿barnabas@bellnet.ca We will be happy to answer your questions.